Last Wednesday, we met around a picnic table at Rotten City Pizza to discuss Sam Quinones’ Dreamland and the ways in which we as emergency providers can work to combat the worsening opioid epidemic. Perhaps no one is more qualified to write such a captivating, multifaceted book on this international crisis than is Sam Quinones, who was a writer in Mexico for over a decade. Dreamland is a story of place, with each chapter rooted in a different city to illustrate how the factors unique to a specific location contributed to the growing problem. Each chapter also revolves around an individual character whose story represents a larger issue. Multiple story lines, initially seeming disparate and unrelated, all come together to form the overall narrative of addiction, and we realize how large and unwieldy the opioid epidemic has ballooned. Quinones shows how a perfect storm of changing business practices in heroin marketing and sales, socioeconomic forces in Xalisco, Mexico and the US rust belt, changing medical beliefs around pain and addiction, and pharmaceutical marketing and development coalesced to form the perfect storm in which opioid overdoses have nearly quadrupled over the last 20 years, now outpacing motor vehicle collisions as the number one cause of accidental death. Quinones focuses on several heavily impacted towns in Ohio, West Virginia, and Kentucky, which helps us make sense of the data regarding alarmingly high opioid abuse/death rates in this region. In the emergency department, we are protagonists in this dark narrative. We frequently treat patients with opioid dependence, overdose, Hepatitis C, HIV, soft tissue infections, or traumatic injuries sustained while engaged in illicit activities. Unfortunately, we are partially to blame -- much of opioid dependence is iatrogenic. A study published in the New England Journal of Medicine earlier this year showed that a single opioid prescription from the ED may lead to long-term use (number needed to harm of 48 pts), and that this risk is greater if the patient is treated by a physician who prescribes relatively more opioids. Of course, we don’t see ourselves a nefarious drug pushes, or even as careless prescribers. Although we are not the highest prescribers, we come fairly close: according to one analysis, emergency medicine physicians prescribe almost 13% of all opioid prescriptions. Even if we aren’t directly getting our patients hooked, we are contributing to a flood of opioid pills onto the illicit market. In some states, there is more than 1 opioid prescription written for every person. In the prehospital environment, the discussion seems to revolve more around acute overdoses and the use of naloxone to reverse them. Many EMS and police departments are expanding who they train to recognize and reverse an opioid overdose with naloxone -- it is no longer just paramedics administering this medication, but also first responders and law enforcement. However, there is increasing worry about the rising cost of treatment as overdoses increase in frequency. In one heavily affected town in Ohio, the local fire department estimates it will spend 50% more than its entire medication budget on naloxone because they respond to so many opioid overdoses; for a town of 48,791, they respond to about 4-5 overdoses a day, and this number continues to increase. Dan Picard, Middletown City Councilman, estimates that each overdose run costs the city $1,104. At this rate, they are not sure how they can continue to afford to provide emergency care to their community. In addition to whether or not acute reversal is financially solvable, it is also unclear the long-term outcome of such reversal practices on patient outcomes. David Showalter, a sociology PhD candidate at UC Berkeley whose research focuses on opioid overdoses, and Dr. Andrew Herring, a physician double-boarded in emergency medicine and pain management, both believe that unless acute reversals are tied into more sustainable interventions, such as take-home naloxone kits, referrals to syringe exchanges, or referrals to medication-assisted treatment, acute reversals by field providers will have little impact on overall morbidity or mortality. But that is where things get a little more controversial -- what kind of sustainable interventions are we willing to support? Some, including Quinones, argue for jail-based and abstinence-only recovery programs, with the goal of getting everyone 100% clean for the rest of their lives. Unfortunately, it’s rarely so simple. The data shows that fatal drug related overdoses usually increase after people leave jail or “drug-free” rehab. Although it may seem less palatable to some, harm reduction modalities seem to be the most effective in reducing heroin use and fatal overdose. Harm reduction is based in the philosophy that we must meet patients where they are in order to reduce the morbidity and mortality associated with drug use. Harm reduction spans a large spectrum of practices, including syringe exchange, naloxone distribution to users and their friends/family, fentanyl testing kits (as many of the recent fatal OD’s have involved accidental consumption of fentanyl), medication-assisted treatment (MAT), and supervised injecting sites. Various emergency departments and EMS systems are starting to distribute naloxone kits to those believed to be at risk of overdose, as well as to their family members and friends. Although some providers worry that providing naloxone encourages further opioid use, studies show the converse is true [1,2,3]. In Massachusetts, opioid overdose death rates are lower in communities with naloxone distribution programs than in similar communities without them. In San Francisco and Chicago, mortality rates among IV drug users decreased after the introduction of naloxone programs [5,6]. Such programs are also considered a cost-effective intervention, in terms of quality-adjusted life years saved per cost spent . So why aren’t more EMS services and ED’s giving prescriptions or naloxone take-home kits? In addition to cost, some may worry about liability if there is an overdose, but many states have enacted good samaritan regulations and third-party prescribing statutes to assuage such fears. Others may worry about providing insufficient training on when and how to use naloxone, but Dwyer et al showed that there are no significant differences in overdose response when training is provided and when it is not . Another successful strategy to reduce heroin use and fatal overdose is through the use of medication-assisted treatment (MAT) with methadone or buprenorphine, which can somewhat be seen as preferred alternatives to illicit opioids. Sometimes, the use of these medications is just a bridge to abstinence, other times, they are taken for the rest of a person’s life. As these programs are so effective, the World Health Organization supports MAT as the first line treatment for opioid dependence for most patients. Although a cochrane review found little difference between methadone and buprenorphine maintenance in terms of treatment retention and illicit opioid use, in Dreamland, Quinones does not paint the most favorable image of methadone clinics, blaming their dearth of counseling and therapy services on their profit-driven motive (p. 64), and describing them as targets for heroin dealers (p.63-66). Dr. Herring, who runs a pain clinic at Highland Hospital, says his patients describe methadone as more disabling than buprenorphine. When on methadone, they don’t feel clear-headed, and they have to go to a highly-stigmatized place every day to get their dose. Therefore, he believes that buprenorphine, which is just a partial opioid agonist, is the preferred agent. It can be prescribed by primary care providers (with a special waiver) out of their regular clinics, and patients can pick it up at their pharmacy like any other medication. It can also be be administered by emergency physicians, and as such, Dr. Hering has started a buprenorphine induction program out of his emergency department. Dr. Kathy Vo, a toxicologist at Zuckerberg San Francisco General Hospital, cautions that we should not be so quick to discount methadone as an effective treatment modality. She believes that the daily clinic visits are vital to the success of some users. Nonetheless, as buprenorphine prescribing is more accessible to emergency physicians, it is bound to become another option in our toolbox for reducing opioid morbidity and mortality. 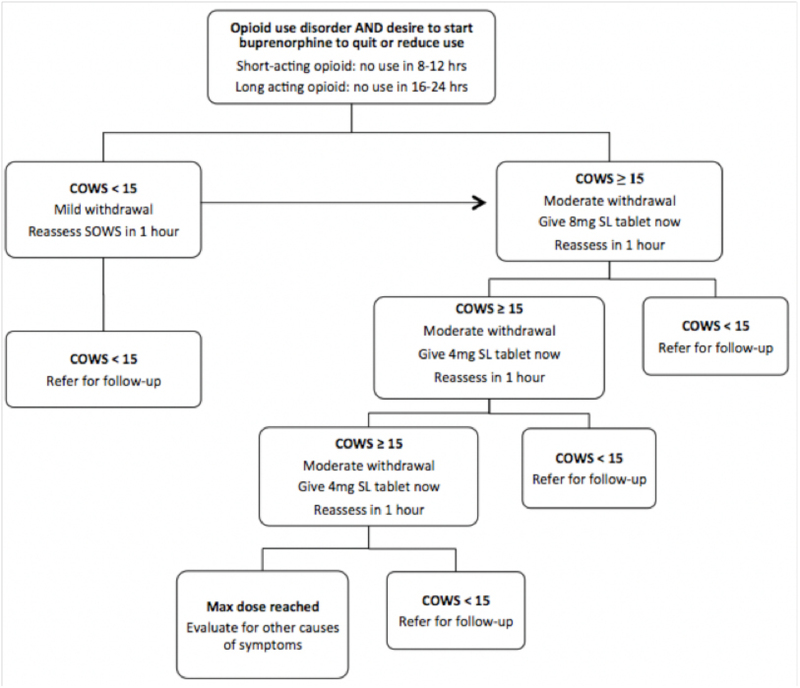 As you do not need a special DEA waiver to provide induction doses for those in acute opioid withdrawal, some emergency physicians are administering buprenorphine in the ED and then referring their patients to other providers who have agreed to continue their patients on maintenance doses. Unfortunately, in many counties heavily hit by the opioid epidemic, there may not be any physicians with a buprenorphine waiver (DEA-x) available to follow these patients. That’s where telemedicine comes in: Various start-up’s are offering telemedicine consults to patients in the ED and at home . So via the same tablet that you use for your interpreter, or your stroke neurologist, you can also consult a pain specialist. And your patient can get their outpatient follow-up via their personal phone or computer. What if your patient isn’t ready to stop using? This may be more common that we would like to think; Dr. Herring says that there is a prevailing mentality amongst providers that patients in the throes of a medical crisis related to opioids -- withdrawal, abscess, fall, overdose -- are in this perfect window for an intervention, for a “wake-up call.” In his experience, that’s not exactly the case. People in crisis often just want to make it through the crisis, and using opioids may be their more familiar method of coping. But even if they aren’t ready to get clean during that traumatic moment, don’t despair -- a different window of opportunity still exists -- one for engagement. Give them referral information about where they can access care. When they are ready, they’ll come. Perhaps this is the most important take-home message for prehospital providers, that we can make a difference simply by providing our opioid-depedent patients with a list of local resources. In the same way that EMS systems have been responsible for creating trauma systems of care, we can start to forge a coheisve network among our emergency departments, harm reduction organizations, and outpatient MAT centers. 1. Seal KH, Thawley R, Gee L, Bamberger J, Kral AH, Ciccarone D, Downing M, Edlin BR: Naloxone distribution and cardiopulmonary resuscitation training for injection drug users to prevent heroin overdose death: a pilot intervention study. J Urban Health 2005, 82(2):303–311. 2. Wagner KD, Valente TW, Casanova M, Partovi SM, Mendenhall BM, Hundley JH, Gonzalez M, Unger JB: Evaluation of an overdose prevention and response training programme for injection drug users in the Skid Row area of Los Angeles, CA. Int J Drug Policy 2010, 21(3):186–193. 3. Strang J, Powis B, Best D, Vingoe L, Griffiths P, Taylor C, et al. Preventing opiate overdose fatalities with take-home naloxone: pre-launch study of possible impact and acceptability. Addiction 1999; 94:199–204. Walley AY, Xuan Z, Hackman HH, Quinn E, Doe-Simkins M, Sorensen-Alawad A, Ruiz S, Ozonoff A: Opioid overdose rates and implementation of overdose education and nasal naloxone distribution in Massachusetts: interrupted time series analysis. BMJ 2013, 346:f174. 5. Maxwell S1, Bigg D, Stanczykiewicz K, Carlberg-Racich S. Prescribing naloxone to actively injecting heroin users: a program to reduce heroin overdose deaths. J Addict Dis. 2006;25(3):89-96. 6. Coffin PO, Sullivan SD. Cost-effectiveness of distributing naloxone to heroin users for lay overdose reversal. Ann Intern Med. 2013 Jan 1;158(1):1-9. doi: 10.7326/0003-4819-158-1-201301010-00003. 7. Dwyer K, Walley AY, Langlois BK, Mitchell PM, Nelson KP, Cromwell J, Bernstein E. Opioid education and nasal naloxone rescue kits in the emergency department. West J Emerg Med. 2015 May;16(3):381-4. doi: 10.5811/westjem.2015.2.24909. Epub 2015 Apr 1. • If today is SUN-THURS, patient should follow-up in clinic tomorrow. • If today is FRI & SAT, patient should receive a 1 or 2 day buprenorphine prescription & then follow-up in clinic on the next business day. Perhaps the success of Harvard sociologist Matthew Desmond’s Evicted, Poverty and Profit in the American City, lies in its engaging style, reading more like a page-turning novel and less like an academic analysis. Through following the ups and downs of its colorful characters, we realize the profound impact that stable housing has on individuals, communities, and their health. Although the setting is in Milwaukee, the lessons are transferable, as unaffordable housing is a problem nationwide. From the individuals’ narratives, we see how easy it is to crash to the bottom if you are poor; there is no safety net to catch you. In the first pages of the book, Arleen and her two boys are evicted after a man breaks down their door. There is little incentive for landlords in poor neighborhoods to pay for costly repairs, as they know that the market for low-cost housing far outstrips demand. After a family has an eviction on their record, they have even less bargaining power, and are thus more likely to be forced into substandard housing conditions, as are Arleen and her boys when they subsequently rent a decrepit $550/month apartment in one of the worst neighborhoods in American’s fourth-poorest city. The rent takes 88% of Arleen’s monthly income, which is not uncommon. The majority of poor renting families spend half of their income on housing, which is far above the traditionally recommended 30%. Given those numbers, perhaps it isn’t so surprising that 1 in 8 renters experienced a forced move between 2009 and 2011 in Milwaukee, and that similar numbers are seen nationwide. Later in the book, Arleen and her boys are again evicted, but this time via the nuisance property ordinance. After their roommate calls 911 in response to a domestic disturbance in the unit upstairs, the police contact the landlord, informing her that she will be responsible for a fine or jail time if there are any further “nuisance activities” on her property, and requiring her to submit a plan as to how she will “abate the nuisance activities.” Her initial plan was not accepted by the police department, but the 2nd plan, eviction of the tenants, was. Nationwide, the majority of nuisance citations are related to domestic violence calls, which discourages victims from calling 911 . A study by Rollins et al suggested that among victims of intimate partner violence, evictions and housing instability were predictors of PTSD, depression, increased work/school absence, and increased ED/hospital use . Additionally, black tenants are more likely to receive nuisance citations, and thus evictions, than are their white counterparts. In black neighborhoods, 1 in 16 eligible properties receive a citation, compared to 1 in 41 in white neighborhoods . Arleen and her boys move into a shelter, and within the span of 2 months, she applies to, and is rejected by, 89 prospective apartments. This is likely secondary to both her eviction record and the fact that she has children. The Fair Housing Act of 1968 did not consider families with children a protected class, so many units charged children-damage deposits and monthly surcharges. In 1988, housing discrimination against children and families was outlawed, but the practice continued. In as many as 7 in 10 housing searches, families with children were turned away . Arleen’s eviction is also a strike against her when applying for public housing assistance. Even if she qualified, ¾ of families in America who qualify for assistance receive nothing. In Milwaukee, the list for rental assistance was frozen . In some cities, the wait for public housing is counted in decades. Evictions have dramatic, negative effects on people’s jobs and children’s educational trajectories. Arleen’s son Jori attends 5 different schools between the 7th and 8th grades, and her son Jafaris starts to show signs of anger issues and learning disabilities, which is not uncommon in children who are experience housing instability. Multiple studies have shown that evictions and housing instability increase rates of depression, suicide attempts, decreased medication compliance, gaps in health insurance, and even low birth weights [3-9]. On April 4th, our interdisciplinary book club met at The Laughing Monk Brewery to discuss the relevance of Desmond’s work to our communities and professional practice here in the Bay Area. In the Mission neighborhood, where many of us work at Zuckerberg San Francisco General Hospital, the Anti-Eviction Mapping Project documents that there have been 908 evictions since 2011 . They also have a map of all evictions in San Francisco, stratified by type, which shows that nuisance evictions are the 3rd most common cause. The statistics and arguments in Desmond’s book support the theory that of all the social determinants of health, housing insecurity may be one of the most detrimental. For those of you who may be new to the term, “social determinants of health,” the WHO defines them as the forces that lead to health inequities and are beyond the span of control of the individual, and include education, race, neighborhood, and labor and housing markets . According to a study by Galea et al, social factors are attributable to more deaths in the US than are acute MI’s, CVA, and lung cancer . In San Francisco, the Department of Public Health began to treat housing instability as a public health issue. They saw that many of their highest users and those who were severely disabled often did not qualify for low-income housing, so they opened their own housing facilities . They obtained federal funds dedicated for initiatives based on Housing First, which is an approach that reduces barriers, such as preconditions of abstinence, to housing, under the belief that addiction and mental health issues will improve after individuals attain a safe living situation. In 2009, JAMA published an article showing that implementation of a Housing First intervention for chronically homeless individuals with severe alcohol problems and high service use lead to a decrease in health care and public service use, saving an average of $2,449 per person after accounting for housing program costs . As an emergency physician in the Bay Area, I have come to see how housing instability affects the health of my patients, and the effectiveness (or lack thereof) of my interventions. Diabetics with DKA because their insulin was stolen while living on the street, patients whose blood pressure was sky-high because their medications were left behind in their old house, patients with severe asthma exacerbations because they did not have enough money left over to pay for their inhaler even after working two jobs, patients whose chronic venous stasis ulcers continue to worsen because they don’t have a clean place to wash and change their dressings. My treatments just feel like a Band-Aid that will become ripped off as soon as they leave the ED. I imagine I’ll see them again in a few days, and the data supports this; a study by the Agency for Healthcare Research and Quality found that ED visits are 9-12 times higher among homeless men and women . As medics and emergency medicine practitioners, what can we do? Dr. Zevin stressed the importance of simply documenting our patients’ housing status and if they have evidence of psychosis. It also helps us better meet our patients where they are, and adds perspective and continuity to future encounters (i.e., is the homelessness or mental illness new or is it years old?). Then we can better address “their barriers to care and the system gaps.” Maggie Roberts JD, a civil rights attorney who often advocates for those with disabilities, emphasizes the value of this simple task; if these patients ever try to apply for benefits, such documentation is hugely important. We also have to decide whether or not we think housing is a human right, and if so, support policies and regulations that increase access to housing. Matthew Desmond suggests making the current voucher system more efficient and expanding its availability to include more people. Josh Seim, a PhD candidate in sociology at UC Berkeley, thinks the solution needs to involve more public housing. As EMS providers, I believe that this is in our wheelhouse. One direct way that we can work to address the negative health effects of housing instability is through community paramedicine initiatives that better plug people into the care they need -- whether that is social services, primary care, mental health, or addiction programs. In San Francisco, ED providers and field medics refer vulnerable, frequent-user patients to their EMS-6 Community Paramedicine team . April, or one of the other community paramedics, and a social worker then go to the field to meet the patient wherever they are, from a tent on the sidewalk to a hospital bed at UCSF, and start to address their individual barriers to care. Often times, this centers around housing instability, so the team helps their clients fill out the necessary shelter or supportive housing applications, or gets them into medical detox programs that can better help them in this transition. They help their patients better navigate the system. If your EMS system doesn’t have a community paramedicine program, there are other ways to have an effect, such as medic-led patient referrals to social services organizations, or EMS Agency support. 1. Desmond, Matthew. Evicted: Poverty and Profit in the American City. 2016. 2. Rollins C, Glass NE, Perrin NA, Billhardt KA, Clough A, Barnes K, HansonGC, Bloom TL. Housing instability is a strong predictor of poor health outcomes as level of danger in abusive relationship: findings from the SHARE study. J Interpers Violence. 2012 Mar; 27(4): 623-43. 4. Burgard SA1, Seefeldt KS, Zelner S.Housing instability and health: findings from the Michigan Recession and Recovery Study. Soc Sci Med. 2012 Dec;75(12):2215-24. 5. Carrion BV1, Earnshaw VA, Kershaw T, Lewis JB, Stasko EC, Tobin JN, Ickovics JR. Housing instability and birth weight among young urban mothers.J Urban Health. 2015 Feb;92(1):1-9. doi: 10.1007/s11524-014-9913-4. 6. Carroll A1, Corman H2, Curtis MA3, Noonan K4, Reichman NE5. Housing Instability and Children's Health Insurance Gaps. Acad Pediatr. 2017 Feb 20. pii: S1876-2859(17)30062-1. 7. Fowler KA1, Gladden RM, Vagi KJ, Barnes J, Frazier L. Increase in suicides associated with home eviction and foreclosure during the US housing crisis: findings from 16 National Violent Death Reporting System States, 2005-2010. Am J Public Health. 2015 Feb;105(2):311-6. 8. Rojas, Y. Evictions and short-term all-cause mortality: a 3-year follow-up study of a middle-aged Swedish population. Int J Public Health. 2017 Apr;62(3):343-351. 9. Rojas Y1, Stenberg SÅ1. Evictions and suicide: a follow-up study of almost 22,000 Swedish households in the wake of the global financial crisis. J Epidemiol Community Health. 2016 Apr;70(4):409-13. 9. Vásquez-Vera H1, Palència L2, Magna I3, Mena C3, Neira J3, Borrell C4. The threat of home eviction and its effects on health through the equity lens: A systematic review. Soc Sci Med. 2017 Feb;175:199-208. 14. Galea S et.al. Estimated Deaths Attributable to Social Factors in the US. AJPH:June 16,2011;eprint. 16. Larimer, Mary E.; Malone, Daniel K.; Garner, Michelle D.; Atkins, David C.; Burlingham, Bonnie; Lonczak, Heather S.; Tanzer, Kenneth; Ginzler, Joshua; Clifasefi, Seema L.; Hobson, William G.; Marlatt, G. Alan (1 April 2009). "Health Care and Public Service Use and Costs Before and After Provision of Housing for Chronically Homeless Persons with Severe Alcohol Problems". JAMA. 301 (13): 1349–57. 19. Hwang SW, Henderson MJ. Health Care Utilization in Homeless People: Translating Research into Policy and Practice. Agency for Healthcare Research and Quality Working Paper No. 10002, October 2010, http://gold.ahrq.gov. It’s a Thursday evening in Oakland, and luckily, the current rain hasn’t gotten in the way of tonight’s book club at Novel Brewing, a book-themed brewery in the heart of the San Pablo corridor. I’m excited that Michael Marsh, a paramedic with decades of disaster and operational experience, and Dr. John Brown, the San Francisco EMS medical director who is also active in our local Disaster Medical Assistance Team (DMAT), will be joining us. Their first-hand perspectives of Katrina will add a more personal touch to the dark drama that Fink so eloquently regales. In Five Days at Memorial: Life and Death in a Storm Ravaged Hospital, Sheri Fink, an MD-turned-journalist, describes the fate of the patients and staff who faced the storm from within Memorial Hospital’s walls. As the decisions made during this unique, chaotic time cannot be evaluated from the place of our normal lives, she begins her expose by providing a historical and sociological context. When Katrina strikes, she provides a clear timeline of how the social framework and other mores governing our everyday lives start to break down, both inside and outside the hospital. We see how the uncoordinated, ineffective initial disaster response leads to further hopelessness. Physicians and nurses start to make up their own triage methods, including giving last priority to any patient with a DNR status, irrespective of their current clinical condition. When the first patients are euthanized, Fink almost makes it seem like the only option. Although a reader might think that this situation was a complete anomaly born out of the unique events that occurred at one crazy hospital, Dr. Mary Mercer, the medical director of the San Francisco Base Hospital, adds that the “expectant death” category of triage was being used in many parts of New Orleans. Before Katrina, this category had never before been utilized in the United States; it had never been necessary. The second half of the book follows the legal battles that ensued, seemingly punishing those that had stayed behind to help. A few days after Katrina, Dr. John Brown and his DMAT team deployed to the Superdome. Because of safety concerns, they were moved to the airport, where many of Memorial’s evacuated patients and staff had already been waiting for days for food, water, and medical care. A few months later, Mike Marsh and other responders coordinated by the Department of Homeland Security met with Dr. Saussy, New Orleans’ EMS Medical Director, to complete an after action review, the formal evaluation of the strengths and weaknesses of a system and its disaster response. Marsh corroborates Fink’s account, and bolsters it with his EMS perspective. As with other medical infrastructure, the city’s 911 system had collapsed. The city emergency operations center flooded, ambulances flooded, people abandoned posts, the EMS base station was underwater, and a high percentage of the prehospital first responders were unaccounted for. The federal after action report and media coverage led to several regulatory changes that have positively shaped disaster infrastructure in our country, including a national contract for ground ambulance support, coordination and integration of DMAT teams, the development of mutual aid for law enforcement, and contraflow evacuation methods. Other cities noted the importance of having an agreed-upon triage system in place before a disaster hits, and began to involve community members in the design process. Unfortunately, these lessons haven’t reached everyone. When reading the after action reports of subsequent disasters, common themes emerge. More recently, when I was providing medical care at Standing Rock during a blizzard in December, I saw more parallels than I would have liked. We also had false information, communication breakdowns, a lack of unified chain of command, unclear triage methods, a patchwork of responders whose actions lacked coordination, and a lack of running water and functioning indoor plumbing. I wished that local leadership had a better understanding of the principles of disaster response, or that they had even read Five Days at Memorial. After about an hour of conversing about various themes in the book, we noticed the omission of a major one: the mental health of patients, their families, and responders. During the recent Ghost Ship Fire in Oakland, the majority of the county’s response efforts revolved around emergency counseling and psychiatric support for the victims’ family and friends. Dr. Brown said that in all of his DMAT missions, several team members always quit, many never to be heard from again. Marsh told the story of a medic who responded to Katrina. Although she witnessed countless human tragedies during her shifts without apparent difficulty, on her drive home, she would always break down because there, on the side of the road, was always lying the same dead baby. At this point, Kelly Coleman, Alameda County’s Regional Disaster Medical Health Coordinator, mentioned the concept of responder guilt, a type of survivor guilt that first responders often experience. Although I had never before heard the term, it gave a name to an emotion that I knew I had also felt. The pre-planning of disaster preparedness should include the mental health of first responders. All-too-soon, the clock struck eight, last sips of beer were finished, and plans were made for our next book: Evicted: Poverty and Profit in the American City, which we will be discussing in April. Stay tuned for the scheduled date to join the discussion via twitter. The content of this post is based on the book and group discussion, and not all statements have been independently verified. One by one, people start to arrive at Greasebox, a local diner in Oakland, CA, for our inaugural multidisciplinary book club session. Only a few of the faces are familiar to me -- my colleagues in emergency medicine and EMS, but the rest introduce themselves as students and practitioners working in sociology and public health. I am not sure if they were attracted by our objective -- to discuss issues loosely related to EMS from a multifaceted approach -- or that the author, Seth Holmes MD PhD, of our first book, Fresh Fruit, Broken Bodies, was here to provide his own personal insights to our bookclub. In his book, Dr. Holmes delves into a time between his medical school and residency, when he lived and worked with a group of migrant farmworkers, beginning with their dangerous journey across the US-Mexico border. Although he is detained in an Arizona Jail, he continues forward. He follows his adoptive family to various farms along the West Coast, living in substandard living conditions and developing chronic pains from hours in the fields. Why would a young physician want to subject himself to living a life in destitution, danger, and hard-labor? For his anthropology fieldwork, Dr. Holmes’ was committed to observing and recording the health and socioeconomic issues related to a population that is largely undocumented and thus uninsured. As a result, almost all migrant workers find it difficult to access many American medical services outside of primary care clinics, emergency departments, and Emergency Medical Services (EMS). Their jobs and living conditions expose them to a high burden of illness and trauma. Agricultural workers have a fatality rate five times that of all workers, and increased rates of nonfatal injuries, musculoskeletal pain, heart disease, cancer, stillbirth, and congenital birth defects. Their children have high rates of malnutrition, vision problems, dental problems, anemia, and lead poisoning. Specifically, Holmes uses three case studies -- Albelino’s knee, Crescencio’s headaches, and Bernado’s stomach pains -- to clearly demonstrate how our medical system fails this population because we don’t recognize the environment they live in or the root causes of their pathology. 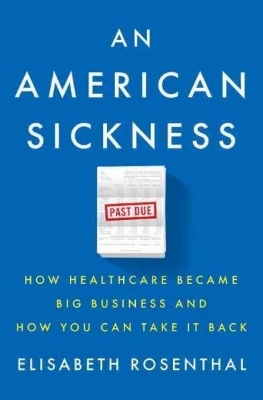 The medical system, and their physicians, failed them. However, as Holmes was not yet a practicing physician at the time of writing his book, his analysis sometimes feels too disconnected from the realities of clinical constraints and modern healthcare. Even if we identify the structural factors causing our patients’ illnesses, we, EMS providers and EM physicians, do not have the tools to solve them. In my 15-minute emergency department visit, I can’t arrange for fair working conditions or safe housing. It is even more constrained in the prehospital world. As emergency providers, what can we really do? In response, Dr. Holmes refers us to a paper that he wrote with Phillippe Bourgois titled, “Structural Vulnerability: Operationalizing the Concept to Address Health Disparities in Clinical Care,” which included a vulnerability assessment tool that can be utilized in our medical assessments. He also recommended including our patients’ barriers to care in our patient’s H&P, even if we cannot directly fix them, so that they become a formalized part of the patient narrative for other providers to see and incorporate. Lastly, if we see certain issues come up over and over again in multiple patients’ assessments, we can work with local advocacy and policy groups to affect large-scale change. The next week, we tried to put these words into action; an EM resident from the book club used the vulnerability assessment tool during a clinical shift. He noticed that although it took only 35 seconds to read out the questions, the answers took significantly more time. He also did not feel qualified to address their needs. Instead of having the physician ask the questions on the assessment tool, perhaps there could be a health coach on-staff in order to screen high-risk patients and integrate local social service organizations into the ED milieu. And that’s when it hit me...maybe there is a role for EMS in this whole complicated issue. We know that paramedics actually meet patients where they are -- whether that is the street or their home -- and have the unique ability to see first hand some of the structural barriers to effective medical treatment that patients might face, such as homelessness, polysubstance abuse, lack of insurance, and lack of a social support network. As a result, I’m working with local partners to incorporate aspects of the structural vulnerability assessment tool into the ePCR so that paramedics have a way to catch patients that they deem high risk of failing medical treatment because of these barriers. For example, when you make your 5th call on that patient living in a dirty Single Room Occupancy (SRO), who is lying in a urine-soaked mattress with a half-drank bottle of vodka at his bedside -- are you surprised that he is again suffering from a CHF exacerbation? If a patient scores high on the prehospital screening tool, they can be referred to a community paramedicine initiative. Overall, Dr. Holmes’ book Fresh Fruit, Broken Bodies is a solid narrative that takes you through a personal journey of the hardships experienced by our migrant workers, illuminating many of the structural issues that get in the way of their health. As the book’s success weighs heavy on its thoughtful content and sociologic theory, don’t expect it read like a page-turning novel. I believe that chapters 1, 4, and 5 have the most relevance to healthcare providers, and recommend you read them in order to deepen your understanding of the barriers that this population faces. Even if you do not work directly with undocumented people or farmworkers, you will come away with a new perspective that can improve your patient care. Five Days at Memorial is the Pulitzer Prize winning work by Sheri Fink, New York Times reporter and physician, about a hospital that faced difficult life-and-death decisions during Hurricane Katrina. How to participate: Share thoughts and questions below, or tweet them live to @MGlennEM during the event! If you want to listen to a great podcast to get you excited, check out the radiolab episode!